You do not have to worry about complicated calorie counting, you do not have to worry about food journaling or calculating the glycemic index of different foods. All you have to be able to do is recognize if what you are about to put in your mouth was readily available to a caveman. * There will be NO sugar foods to put on belly fat. Cavemen did NOT have pop, pastries, donuts, sugar cereal, or desserts. * You will make a huge reduction to minimal intake of grain-based foods like bread, pizza, spaghetti, pasta casseroles, and rice. Fat will melt away. 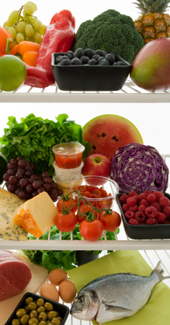 * You will embrace fresh fruits and leafy green vegetables. * You will get your protein from solid sources like fish, turkey, and grilled chick breasts...NOT protein shakes or smoothies. * Do not even think about eating sugar-filled protein bars or so-called "energy bars." * This simple diet will help you learn the enormous benefits of drinking water as they related to losing weight. You will get away from coffees, sweet teas, and chemically-laden diet pop. * Fat loss will be accelerated by integrating regular and consistent exercise of strength building workouts and interval training workouts, including sprinting for fat loss. The caveman diet is simple and sensible. It can help you get rid of embarrassing male belly fat and help you get the Lean Hollywood Look that women admire in men. 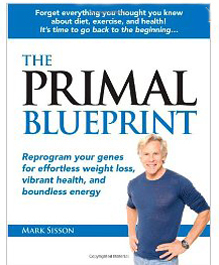 Mark Sisson is, probably, the leading authority on Caveman/Paleo eating strategies. His newest book, The Primal Blueprint 21 Day Body Transformation has become a best-seller. He's taken his first book, the Primal Blueprint, and condensed it into a colorful and dynamic 192-page guide for getting a cut, muscular build.